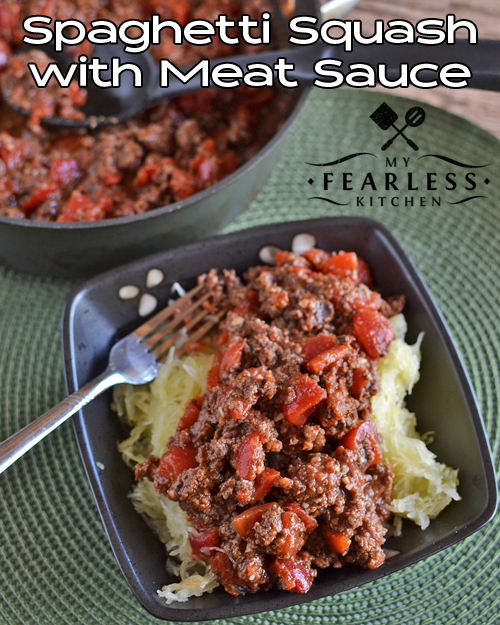 This Spaghetti Squash with Meat Sauce is a fun way to get lots of veggies into a meal. Make a double batch and freeze some for a fast meal on a busy night. 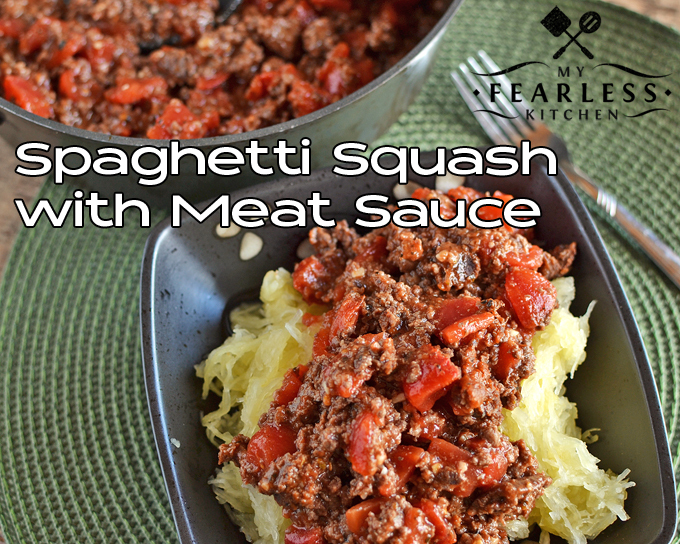 This Spaghetti Squash with Meat Sauce is a great way to get lots of veggies in one meal. The sauce is packed with lots of tomatoes as a veggie bonus! I used ground beef in the sauce, because we always have a lot of it. You can substitute ground pork, turkey, or even chicken instead if you prefer. (Find out more about the different types of ground meat here.) You could also easily leave the meat out of the sauce to make this a vegetarian dish. This is a great two dish meal – one baking sheet for the squash, and one saucepan for the sauce. Gotta love less dishes to wash! Spaghetti squash is a fun substitute for pasta, if you’re looking for a change. 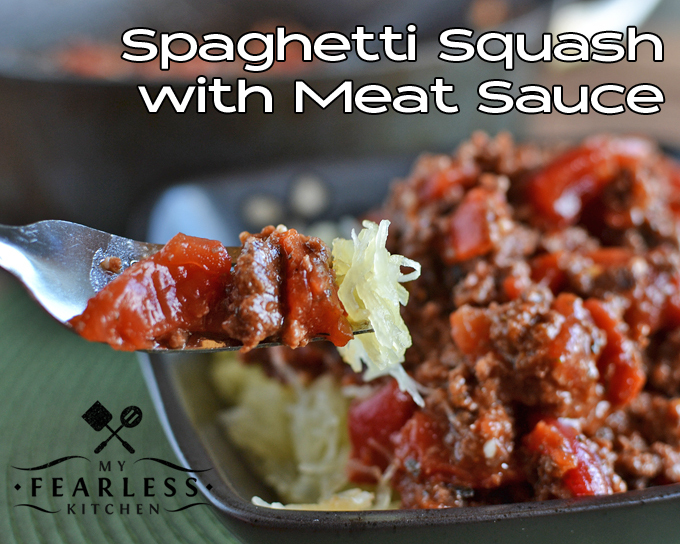 Of course, my toddler won’t touch it, but he does like this meaty sauce! The spaghetti squash takes the longest to cook, so get it ready before you start the sauce. You can brown the meat and start the sauce while the spaghetti squash is cooling. I like to roast a bunch of spaghetti squash all at once, and freeze it for easy eating later. I used a large can of diced tomatoes in this sauce. I did spring for the slightly more expensive diced tomatoes this time. I wanted to be able to really see and taste the big chunks of tomato, instead of in this Slow Cooker Chicken Chili where the tomatoes were slow-cooked all day. I used plain tomato sauce, and doctored it up a bit with dried basil, dried oregano, and minced garlic. I usually mince fresh garlic cloves into my sauces, but I was in a hurry and didn’t want to deal with my garlic press. So I grabbed a jar of minced garlic from my refrigerator, and used 2 teaspoons of minced garlic instead of 4 fresh cloves. I like to use “fresh” ingredients as much as possible, but sometimes convenience and speed is a bit more important to me. Then I’m not afraid to substitute in pre-made, pre-chopped, or frozen or canned options. Since I’m using squash instead of pasta, I don’t feel too bad about indulging in some good bread with this meal. When I have time, my favorite is this Easy Homemade Bread. If I don’t have time (or I forget, because that happens sometimes), I grab a loaf of French bread from the grocery store. Have you ever cooked spaghetti squash before? What’s your favorite way to eat it? Cut spaghetti squash in half and scoop out the seeds. Place spaghetti squash, cut side down, on a rimmed baking sheet. Tent loosely with aluminum foil. Roast at 350 degrees for 40-50 minutes, until fork-tender. Let cool, until you can easily handle the squash. Hold the squash in one hand, and scrape the flesh out of the squash with a fork. The squash should easily peel away in spaghetti-like strings. Brown ground beef in a large saucepan. When beef is cooked, stir in the spices, tomato sauce, and diced tomato. Simmer over low heat until sauce thickens, about 10-20 minutes. Spoon over spaghetti squash and toss to mix. Thanks for this recipe! I have been meaning to try this. Need to incorporate some healthy meals, especially this time of year! Mary Beth, I liked this recipe. I have never grown spaghetti Squash before & have not seen it in the market. Guess we will try some in 2017 garden. I attended a Homemaker mtg. recently where we prepared a meatless Spaghetti dish. Using 1 cup black beans, 1 cup broccoli florets , 1/2 diced yellow onion ,1/2 t. Italian seasoning, 1 t. olive oil, with 1/4 cup cheese melted on top at the end. I thought you might give it a try. (I haven’t tried your recipe yet! Thanks, Evelyn, that sounds delicious!